LINQ is awesome. It allows us to write powerful, succinct, and expressive code that’s a pleasure to read and maintain. The only problem is that using LINQ means sacrificing the debuggability of your code for its readability. If you F10 over a line of code that’s using LINQ – you’ve just performed a whole bunch of complicated logic, but you get absolutely no insight into what actually happened. When debugging LINQ, using breakpoints and manual stepping can be a futile waste of time. OzCode’s groundbreaking LINQ debugging visualizations allows you to see exactly how the different items passed through the LINQ pipeline, and see the return value of each and every lambda expression, all while leveraging powerful OzCode tools such as Reveal and Search. 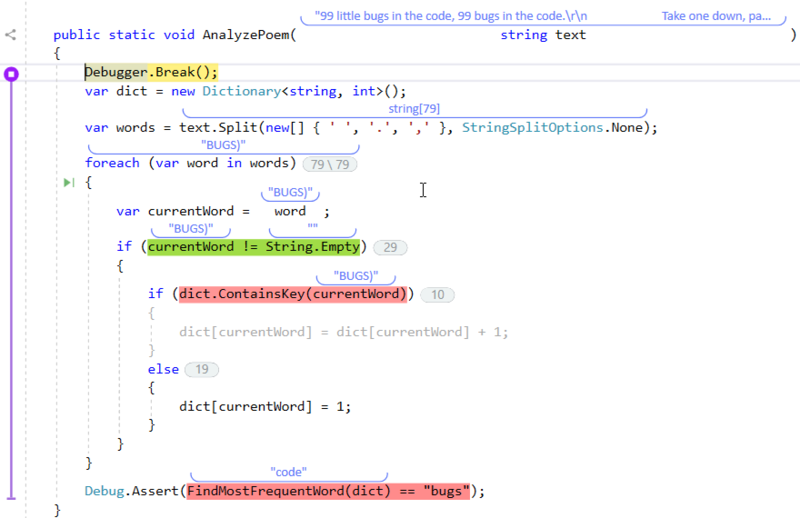 Note: LINQ Debugging is only supported in VS2015 and up. .NET Core is not yet supported, but support is coming soon. During debugging, when the execution point (the yellow line) reaches a LINQ query, an indicator appears next to each LINQ operator, denoting how many items it produced. These indicators show you at-a-glance how many items were consumed by each operator, and how many were produced, helping you decide which operator to focus on. Clicking on one of the numeric indicators puts OzCode into LINQ Debugging Mode, and opens the LINQ DataTip window which shows the items the given operator produced. You can press the “before/after” buttons in the DataTip to quickly switch between the items that were produced and the ones consumed by that operator. Clicking on one of the items will update the Head-Up Display to reflect what each lambda returned as that particular item passed through the LINQ pipeline. Another option is to use the mouse wheel while hovering over the numeric annotation to quickly scroll through the items, seeing their values change instantly in the debugged code. One of the hardest bugs to tackle is when an exception is thrown from deep within a complicated LINQ query – this is almost impossible to debug. OzCode will warn you about such an exception before it is even thrown by highlighting the LINQ Numeric Indicator in red, letting you drill down using the LINQ DataTip or LINQ Analysis Window to find out exactly which item caused that exception! When using LINQ to query, filter and transform collections, a developer has a choice between two flavors – the lambda-based fluent API, or the SQL-like query expressions. The choice of which syntax to use depends on personal preference, as well as the nature of the problem. The fluent syntax is more terse, and tends to be preferable when the query is simple. However, some more complicated queries are much more easily expressed with the query syntax, which allows you to leverage the ‘let’ keyword and multiple from clauses to work with complicated data. 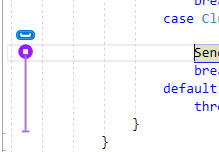 OzCode fully supports both flavors of LINQ. When you use the query syntax, OzCode will visually highlight which items came from which from clause, what values were calculated by the let expression for each item, and more! Export allows you to save a textual representation of an object instance to a file or to the clipboard, to be used after the debugging session has ended. With Export, a developer can “grab” objects and save them as either JSON, XML or even as a C# code that can be used to create Unit Tests with the values of the last debug run. Once the exported instance is saved (or copied to the clipboard), it can be used to reproduce the instance state, analyzed or compared using external diff tools. For the JSON output, OzCode uses the industry-standard Newtonsoft Json.NET serializer, which makes it super easy to deserialize and work with the result. Debugging complex expressions is never easy. How do you see what was returned by a method call? What did each boolean condition evaluate to in a long convoluted if statement? Without simplifying the code or adding variables to store individual results, answering these questions is difficult. With OzCode’s powerful “Simplify” visualization, you can instantly figure out exactly what is happening in your code! When stepping over an expression, a red/green color coding will tell you exactly which expressions returned false/true, respectively. The red or green indicate the result of the entire expression. Simply click the Simplify button and the expression will be visualized instantly, giving you the option to drill down and see individual expression results. Conditional Breakpoints can make debugging so much more productive, but without OzCode, using them feels like a chore. OzCode makes adding a Conditional Breakpoint super easy! In just a single click, OzCode will set up a Conditional Breakpoint based on a specific property value, and pre-fill the predicate for you. Want to add more predicates to the breakpoint? Take a shortcut! Simply hover over the relevant variable, and click the “Add Condition” button. OzCode’s Predict will alert you of an exception that’s about to happen. But that’s not all – if, for instance, OzCode detects an imminent NullReferenceException, you’ll see a red highlight showing exactly what expression is going to cause the exception! OzCode’s predictive exception analysis makes it super-easy to fix an exception before it even happens, with the powerful of Edit & Continue! When comparing two long strings – such as two XML or Json documents, Compare will automatically launch your favorite Diff tool, making it super easy to spot the difference between the two. You can configure Compare to use either Visual Studio’s native diff tool, or an external diff tool, under OzCode->Options. The hardest bugs to solve are the ones that involve mysterious side effects. Consider a long and complicated method which takes an object and performs various mutations on it. Would you be able to tell what has actually changed? For a class with many members, which might also contain a few members themselves, finding the differences is difficult. With Compare you can now save an object’s state and later compare the object, during debugging, to its original saved state. After the function executes, you can choose the Compare to Snapshot option to see the differences. When you save a snapshot of a given object, it will now persist across debugging sessions! You can save a snapshot of an object, stop your debugging session or even close Visual Studio, and then come back the next day and compare a live object to the snapshot you had saved!